What's coming to your local comic shop tomorrow? Lost espionage tales of the Marvel Universe, a new Supernatural comic, and one of the most 1990s X-Men stories every printed. Let's dig in! After the big relaunch of last month, DC is introducing a raft of miniseries highlighting certain characters — this week sees the release of Huntress and Penguin: Pain And Prejudice. A particularly wacky-looking miniseries coming out Wednesday is Howard Chaykin's Avengers 1959. 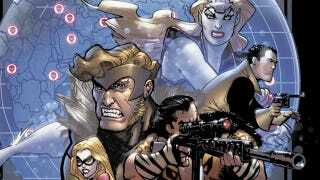 This comic details Nick Fury's secret Fifties superhero team, which includes such weirdos as Sabretooth, Kraven the Hunter, and Namora. There's a new Supernatural title penned by DMZ's Brian Wood — this issue sees Sam Winchester taking a jaunt out to the UK. IDW Publishing is also releasing a new comic based on Dungeons and Dragons: Dark Sun. Finally, Thor: The Mighty Avenger scribe Roger Langridge releases his first issue of Snarked, a madcap take on the works of Lewis Carroll. A bunch of DC's better New 52 titles get their second issues this week — we're looking at you Action Comics, Animal Man, Swamp Thing, and OMAC. There's also Red Lanterns (I was apparently the only person who liked this comic) and Stormwatch (I'm still pulling for this to pick up). You can find our full rundown of DC's New 52 here and — just for kicks — here's Jim Shooter's take on Red Hood and The Outlaws (you know, that Starfire issue). Other issues out on the stands include iZombie, Sweet Tooth, Chew, Invincible, The Walking Dead, The Boys, Casanova: Avaritia, Mark Millar's Superior, and the final issue of X-Men Schism. Looking for a book by one of the youngest authors in comics right now? Try Axe Cop: Bad Guy Earth is out. Want a book you can lend to your mother? Grant Morrison's All Star Superman is out too. (Well, my mom really liked it, but she's always been a Superman fan. Hell, she puzzled her way through Death of Superman with me and my brother back in the dark ages.) Speaking of Morrison, his miniseries Fantastic Four 1234 gets a reprint. Speaking of 1990s throwbacks, X-Men: X-Cutioner's Song is out in hardcover. Put on some Alice in Chains, watch the Rob Liefeld Levis ad a dozen times (yeah, I know he didn't illustrate this comic), and take a bath in a pile of Marvel Masterpiece trading cards. For more modern fare, there's the seventh volume of The Walking Dead and The Definitive Irredeemable (both hardcover). Fang fanatics can anticipate the release of the first volume of American Vampire and The 30 Days of Night Omnibus (both paperback). As usual, here's the list of everything being released to comic stores tomorrow, and you can find your nearest comic retailer here. Rock over Hell's Kitchen, rock on Mogo! Worthington Industries — our CEO has hollow bones!